Former Arizona lawmaker Gabrielle Giffords threw her support behind a Washington state initiative meant to prevent potential gun violence. Initiative 1491 will allow extreme risk protective orders to be placed on an individual who poses a potential threat to themselves and others, allowing for the confiscation of their firearms, a provision opposed by many gun rights advocates. Giffords barely survived an assassination attempt in 2011 and has championed the cause of gun control since. 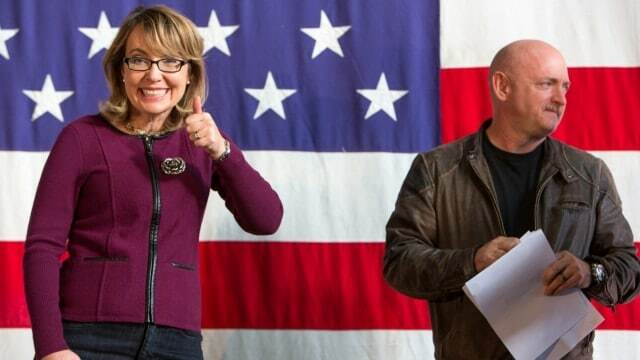 Giffords’ husband, retired U.S. Navy captain and NASA shuttle astronaut Mark Kelly was on hand to lend his support. The two founded political action committee Americans for Responsible Solutions and join Everytown for Gun Safety in support of the Washington initiative. Gun control groups were victorious in 2014, when they turned to voters to push through I-594, a background check initiative that appealed to a majority of voters in the state. California has a similar law allowing for protective measures, called gun violence restraining orders, which allows police or family members to petition a judge to order the temporary confiscation of an individual’s guns if they can prove that person is a safety risk and could use the weapons to harm themselves or others. Everytown funder Michael Bloomberg pitched in $50,000 to help push through the new Washington initiative, Guns.com previously reported. The luncheon Gifford’s attended on Monday raised at least $750,000, Seattle PI reported. Washington has one of the most influential gun rights groups in its backyard. The Bellevue-based Second Amendment Foundation fervently opposes the protective order initiative.